DC Comics announced their big event for year’s end – Doomsday Clock. It spins out of DC Rebirth and Batman/Flash: The Button. Geoff Johns and Gary Frank are on writing and drawing duties respectively. Geoff Johns spoke to Blastr and noted that it’s a Superman and Doctor Manhattan story. The announcement came at late on Sunday so it made the Monday comics news cycle – the third Monday in May – Miracle Monday. Miracle Monday first appeared in Elliot S. Maggin’s Superman: Miracle Monday novel and subsequently appeared in Superman # 400. It’s basically the story of how Superman beat the devil. The villain, CW Saturn was a demon that unleashed Hell on Earth, trying to convince Superman to kill an innocent to stop his reign of terror. Superman, of course, never relents and since the demonic CW Saturn was governed by rules, he was forced to give Superman a wish. Superman makes the most Superman wish of all by wishing everything the villain did was undone. As a result, no one knew exactly what happened that third Monday in May, but they felt an intense sense of relief and commemorated it every year since. The holiday gets more play on Twitter than it does in the actual comics but it’s beloved by those that know the tale. It sums up the Superman mythos’ hopefulness against all odds. I find it weird that Geoff Johns, a demonstrated fan of DC history, announced this book on Miracle Monday. Superman and Doctor Manhattan are the most powerful characters in their worlds. Superman inspires the DC Universe with his unending hope and decency, Doctor Manhattan’s detached cynicism prevented him from saving his world. While DC Comics published Watchmen, I’ve never thought of it as a DC Comic. 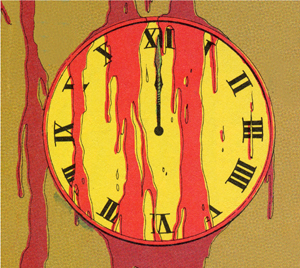 Watchmen isn’t a universe, it’s a story. I understand that DC Entertainment owns Watchmen as long as it is in print, but I’ve always felt icky about anything that presents Watchmen as an unmined property. It’s a singular work. The Before Watchmen event reinforced that. They didn’t so much add to the universe as they expanded on what we already knew about Alan Moore and Dave Gibbons’s work. Still, I think of Geoff Johns and Gary Frank’s Superman: Secret Origin and can’t help but want to see their vision of Superman face off against his antithesis (though I wish it was Allen Adam of Earth 4 and not Doctor Manhattan). Superman was born in serialized fiction. He fights the Never Ending Battle for Pete’s sake! Doctor Manhattan is a character a story. It’s like Aquaman hanging out with Ishmael. It will probably sell really well though – and that’s the name of the game isn’t it? Sometimes bringing a character back from the dead makes perfect sense given the context. If you’re a bug-like superhero affiliate of the New Gods then why not be coccooned for almost thirty years our time? Bug! 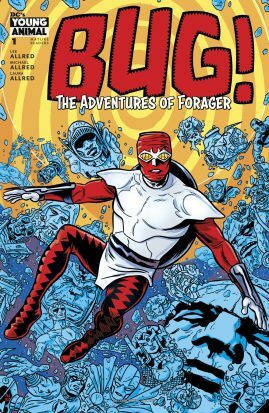 : The Adventures of Forager is nutty and fun tribute to Jack Kirby that only the Allred family can pull off. There’s also an underlying darkness and surreality befitting of the the semi-recent Young Animals imprint, which from what the looks of it is serving the same role as Vertigo comics once did, that of an adjacent place to the main DC continuity for creators to play around with established DC characters. In the case of Forager aka Bug, a lot of readers probably won’t remember the last time he appeared in a comic. Cosmic Oddysey was a miniseries told in four parts, published from 1988-1989. In it the Universe is in grave danger and Forager gives up his life to save it. He was a minor character who managed to step up to the plate and do what a team consisting of powerhouses like Superman, Batman, Martian Manhunter, Darkseid, Orion and Green Lantern John Stewart could not. This comic is the first time we really get into the character’s head, and much like DC/Vertigo series like Sandman Mystery Theater or Animal Man there is a lot of extra room to maneuver in, since the character hasn’t been analyzed and explored to death like a Superman or a Batman. Forager finds himself in a dream state, trapped in an old house filled with monsters. There is an evil teddy bear and phantom little girl that the Golden Age Sandman is trying to capture. It turns out the monsters are helping Sandman do this, and it also turns out that they are trying to find Forager and rescue him. Something is afoot in the worying catch up and managing the frantic chaos Bug “awakens” to from his coccooned coma. It’s frantic, kinetic and action-packed weirdness that would make the King of Comics proud.ld of dreams, and whatever it is is trying to break out into the world of the living. Forager is also referred to as Bug numerous times, causing him to consider the demeaning name as his own. See, he’s from the Insect Empire and Forager is just his job title in the collective, because while he’s a man he lives like a bug. There is a lot to unpack in this issue, and it takes three Allreds to do it. The Jack Kirby-influenced art of Mike Allred combined with the eye-popping colors of Laura Allred provide a sharp contrast to the surreal and dark predicament that Bug is in. Considering all the strange things happening in this issue that I explained above it’s an appropriate combination. Mike’s brother Lee Allred frames it in such a way that you’re not completely lost playing catch up and managing the frantic chaos Bug “awakens” to from his coccooned coma. It’s frantic, kinetic and action-packed weirdness that would make the King of Comics proud.ld of dreams, and whatever it is is trying to break out into the world of the living. Forager is also referred to as Bug numerous times, causing him to consider the demeaning name as his own. See, he’s from the Insect Empire and Forager is just his job title in the collective, because while he’s a man he lives like a bug. Ever since the adventures of Madman caught my eye in the 90’s I’ve picked up everything Mike Allred has done, it looks like this is no exception. It’s a bit challenging to jump into Bug!, and much like Madman it may not be for everyone. Despite that it’s a rewarding and weird read full of glorious visuals.